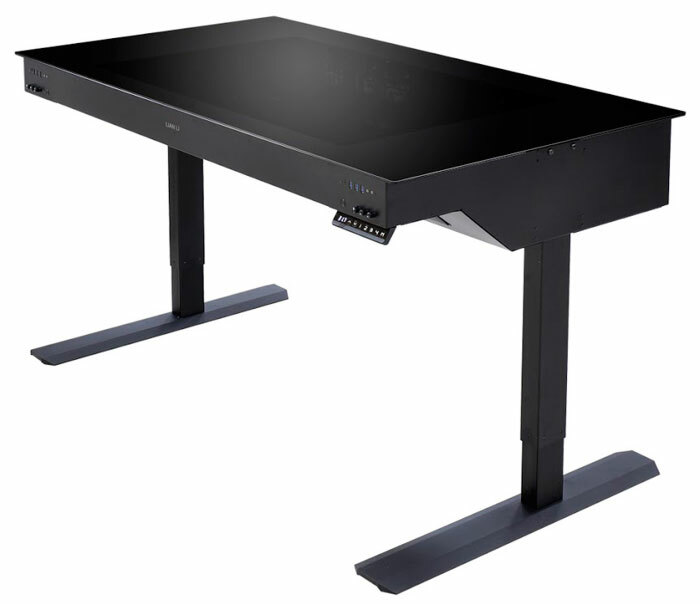 Lian Li first showcased its new Dual-System DK-05 motorised adjustable desk chassis back at CES 2017. At the time Lian Li heralded the DK-05 as "the new pinnacle of PC desks," as it took lessons learnt from the DK-04 and its predecessors to create a new design that accommodated up-to twin EATX motherboards within an all-aluminium construction and under its tempered glass top. 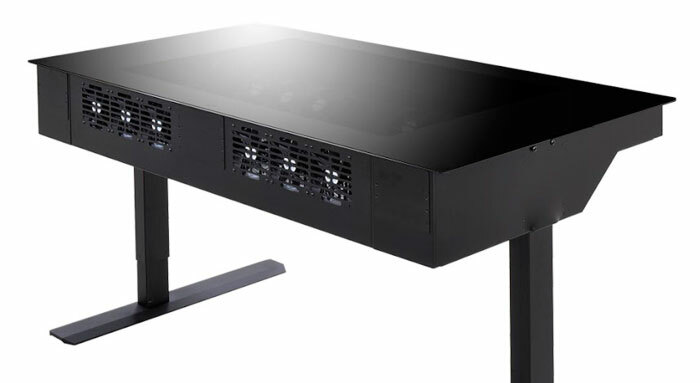 With twin 305x276mm motherboard trays under its top the DK-05 is a very versatile chassis. The under-glass compartment is designed to allow you to build a powerful workstation without the need of a large or bulky computer chassis on or under your deskspace - cutting the clutter. Lian Li has built the DK-05 to accommodate a multitude of powerful components and any necessary cooling systems. Each motherboard tray can fit a board with up to 8x PCI and PCI express cards, a power supply, and two 2.5-inch drives. There is further room for various drives within the shared space. Between the motherboard trays Lian Li has designed space for liquid cooling systems with associated reservoirs, pumps and fan trays for 360mm and 480mm radiators. Both sides of the DK-05 have their own local I/O panels with USB 3.1 Type-C, USB 3.0, HDMI, HD-Audio, and RGB adjustment dials. Another control on the front right hand side is dedicated to operating the motorised desk height adjustment. Users will find there's a height indicator (inches or cm), manual height adjustment buttons and height memory recall buttons. In the UK the Lian Li DK-05 is currently available for £1999.99 at OverclockersUK. US residents can grab one for $2099.99 at Newegg, but at the time of writing all stock has been snaffled up. Can they make corner desks? It's really a high end dual motherboard chassis with electrically adjustable legs! But it still won't fit in the space I have for my desk, without being right-angled… and in fact, if I get some o' them RGB motherboards, they could be laid out in a cool-looking V-Twin kinda configuration!! That's disappointing. When I saw “motorised” in the page title I was hoping to be able to take it for a spin.